Emergency Dentist for Downtown Washington, D.C. In Pain? Call Us Now! A busy day at work or a fun family outing can quickly become derailed by a cracked tooth or serious mouth pain. When you’re in need of emergency assistance, don’t hesitate to contact Davidson Dental Associates! 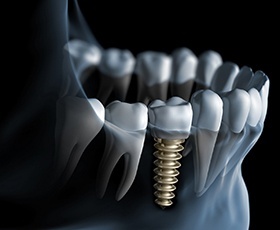 Our office has a team of dentists (including several specialists) at your disposal here in the Washington, D.C. area, and we strive to make time in our schedule for urgent cases as soon as possible so that patients do not have to wait long for relief. Rinse your mouth with warm water right away. If a significant part of the tooth has become dislodged, save it and plan to bring it with you to our practice. If your face starts to swell because of the injury, a cold compress held against the cheek can reduce this effect. 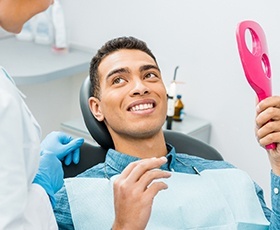 If you still have the tooth, carefully rinse off any dirt or debris from the crown while leaving the root and natural tissue as untouched as possible. Then, place the tooth carefully back into its original position within your mouth. If this isn’t possible, the next best option is to store the tooth in a cup of milk or water. 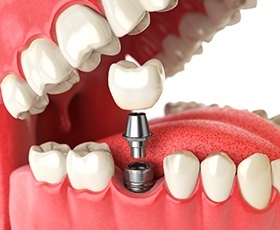 There is a very limited window of opportunity for teeth to be reattached, so don’t wait to contact our office! Rinse your mouth and then carefully floss – the discomfort could be caused by a piece of stray food caught between the teeth. 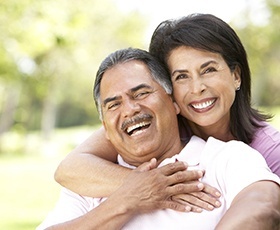 If the pain won’t dissipate, contact Davidson Dental Associates for further assistance. In the meantime, you can take a painkiller, but don’t ever place aspirin directly against the gums. It could burn the gum tissue. Clean the injured area gently with a washcloth. If there’s bleeding, apply pressure to minimize it. A cold compress can also alleviate any serious swelling. If your mouth is still bleeding after 15 minutes, we recommend that you contact us or proceed to your local emergency room.